Zygmunt Landau was born into a family of rabbis in 1898 in Łódź, later studying with Henri Epstein at Jakub Kacenbogen’s drawing school before enrolling in the studio of Stanislaw Lentz at Warsaw Academy of Fine Arts. By the time he was 18, he was already teaching painting. He arrived in Paris in 1920 and settled at La Ruche, attending the Grande Chaumière, the Colarossi Academy and befriending Moïse Kisling. In 1928, he returned to Poland to exhibit in Warsaw and Łódź. His work was also recognized in the United Kingdom and in the United States, thanks to his friendship with the influential British painter and critic Roger Fry, with whom he later shared a flat in Saint-Tropez. In the late 1930s Landau illustrated Edmond Fleg's Ecoute Israel (Listen Israel) published by La Cigogne editions. Upon the outbreak of war in September 1939, Landau fled to Saint-Tropez, where he remained afterwards, also living in Nice and Paris, where he exhibited regularly, as well as in London and in Stockholm. Towards the end of the 1950s, he settled in Israel. In 1962, he produced stained-glass windows for the little chapel of the Y.M.C.A in Tiberias, Israel. He died in Israel later the same year. 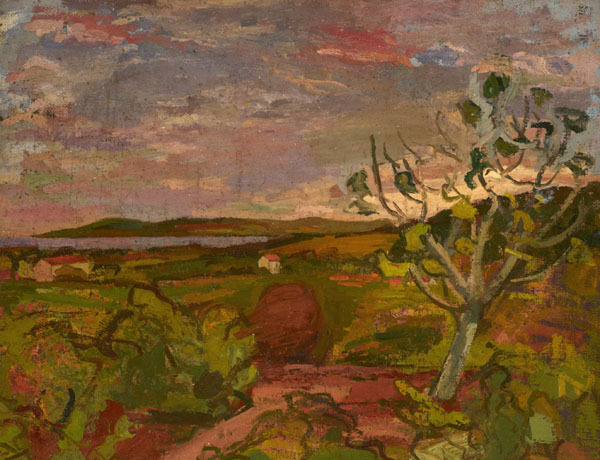 Landau's two vibrant French landscapes, both probably dating to the 1930s, show his admiration for Cézanne.